Traveling is always an interesting experience. I travel a lot. I would know. I think the most hectic (albeit convenient) form of travel is flying. I fly so often the process doesn’t really faze me. Even though I know exactly what to expect every time I fly, I still find myself getting flustered about certain things I should have seen coming. It was on my most recent flight, from Charlotte to Norfolk, that I decided to make a short flying guide with my expansive travel knowledge. I took this photo on my way back from Italy one time…I don’t know who the guy is but he was a perfectly delightful seat companion. Just a heads up. You will come across one if not all of these at some point in your travel career. Sorry but this list does not include solutions to these problems. 1. At some point, you will be stuck on a long flight with an unruly child behind you. I’ve encountered this numerous times and no matter how many Tylenol PMs or mini Sutter Homes bottles I polish off, noisy babies are always annoying. On my last flight, the kid was sitting in the seat in front of me. This can almost be as annoying as having them behind you. When they’re directly behind you, the worst part is the constant seat kicking and piercing screams directly in your ears. When they’re in front, you have to deal with them turning around in their seat and staring at you over the headrest. Staring competitions make me uneasy, especially when my competitor is relentlessly drooling and simultaneously chewing on the raised armrest. Either put a muzzle on your children or teach them how to behave in public. You have to wear the seatbelt on the airplane, end of story. Sit down and play with your Dora the Explorer doll before I feed you to the plane engine. Just kidding. 2. There are always certain types of people that you will have to sit next to. A) You will have to sit next to a fatty. 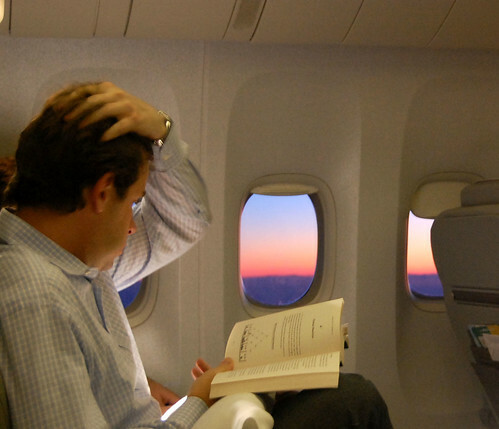 And you will either be in the middle or window seat when this happens. It is unavoidable and you should come to terms with the fact that you might only get to sit in half of your seat as soon as you board. This way, you can rejoice if you sit next to an average size person. Like they say, always prepare for the worst. B) You will have to sit next to some guy that won’t shut up. This person will likely either [a] want to know your life story, [b] think you are terrified of flying and attempt to make you feel comfortable even though you are basically as experienced as the pilot, or [c] want to take you on a date once you land. No matter what scenario, this person is savagely annoying and you are stuck with them for the next hour or more! =D Don’t even think about pulling out your book or iPod in an attempt to avoid them. The rest of your flight will be spent answering shoulder taps or helping them with a crossword answer, because face it, you look like someone with an expansive vocabulary. C) You will have to sit next to some lady that wants to read your Cosmopolitan over your shoulder. She can afford a plane ticket, but not her own magazine. Don’t even think about offering to let her borrow it later on in the flight because she will politely refuse. I mean, why should she have to hold it and turn the pages herself when you are so kindly doing that for her? 3. Your flight will get delayed for an hour or more, and you will be in the most uncomfortable airport ever. This will also happen either very early in the morning or very late at night and most of the stores/restaurants that you want to go in will be closed. Don’t worry, the gate attendants will be very nice and always keep you informed with constant updates because you live in Happy Land where you are a paying customer and the airport employees actually give a damn. 4. You will fly in the summer on a plane with no air conditioning, probably while dealing with the situation in #2A on this list. You will ask the flight attendant if the pilot could please turn the AC on and she will tell you, “we’ve made the pilot aware of the problem and it should cool off once we leave the tarmac.” This is completely untrue. Don’t believe her. Ask for a cup of ice or four and sit there miserable until you land. That is your only option. 5. Your luggage will get lost. Maybe for a day, maybe for a week, maybe only for a few hours, but it will be your fault and you will be putting the airline at a huge inconvenience by asking them to locate your belongings. How dare you. But thanks for flying with us and we look forward to serving you on your future flights! BTW I read this to my mom and she laughed every bit as hard as I did. Your great at romance novels (romance novel sounds so naughty doesn't it?) but I REALLY love your satirical writing too, you should continue this.